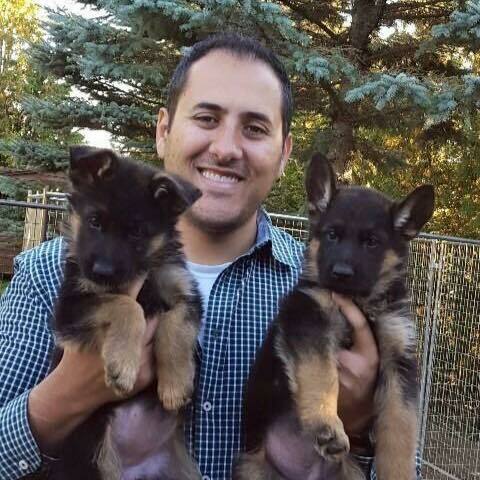 Our Mission at Vom Issam Haus German Shepherds is to provide Quality, Healthy, Well Bred German Shepherd puppies in Toronto, Ontario and around the world to happy families. We accomplish this, by breeding the best and healthiest German Shepherd parents we can find, we make sure that the bloodlines are from the best that Europe has to offer. Many of our breeding’s are done overseas with our affiliate kennels. We breed top notch German Shepherds that are registered with the Canadian Kennel Club and the Verein Fur Deutsche Schaferhunde (S.V) in Germany. We breed, because it is a passion, preserve the breed and most of all provide our customers with healthy, sound German Shepherd puppies. We feed our German Shepherd Puppies premium dog food and work closely with our Veterinarian to develop and maintain high quality standards and ensure the health and well-being of our dogs and puppies. Our goal is to build a long lasting relationship with our clients, many of whom have become close friends of Vom Issam Haus. We strive to produce healthy, quality German Shepherd puppies that will become a member of your family for many many years.